For the gluttonous, the miserly and everyone in-between – grab even more GTA$ this weekend when playing the Adversary Modes that were released alongside GTA Online Heists. If you haven’t yet had a chance to play these three new Modes – which require mastering tactics such as mowing over cyclists in a truck, executing sawn-off shotgun drive-bys and defending against onrushing hunters out for your head – the Double Cash rewards for all who play make it a great time to start. To jump straight into Double Cash Adversary Modes, simply hit the Event button during the GTAV boot screens and you'll find yourself in a lobby with other cynical mercenaries straining under the weight of their loot. If Double $$ isn't enough of an incentive, be sure to stick around 'til the end of the Playlist and you'll be rewarded with an explosive armory completion bonus including Sticky Bombs, Molotovs, Proximity Mines and Body Armor so you can blast your way to the front of the line during your next shopping spree at Ponsonby's. With six new vehicles to choose from you'll want to select your new ride carefully, whether it's the mighty Pegassi Osiris, the Benefactor Stirling with gull wing doors, or the sumptuous Luxor Deluxe. Take each one for a test drive with 2X RP in all Races all weekend. If your accountant is finding it difficult to get creative with the source of your new earnings, it may be time to clean that dough by treating yourself to the spoils of war. Accessorize your hefty bank balance with stylish living quarters as well as garages fit for a kingpin. With a cool 25% off High-End Apartments and Garages, now's the time to upgrade to the next level of living, or increase your garage capacity so you can squeeze in a few more cars. In the great banquet of life, hanging around the top table there will always be bottom feeders waiting for scraps; thankfully the smugglers have got those choosy beggars covered with bounties delivered from on high throughout the weekend. 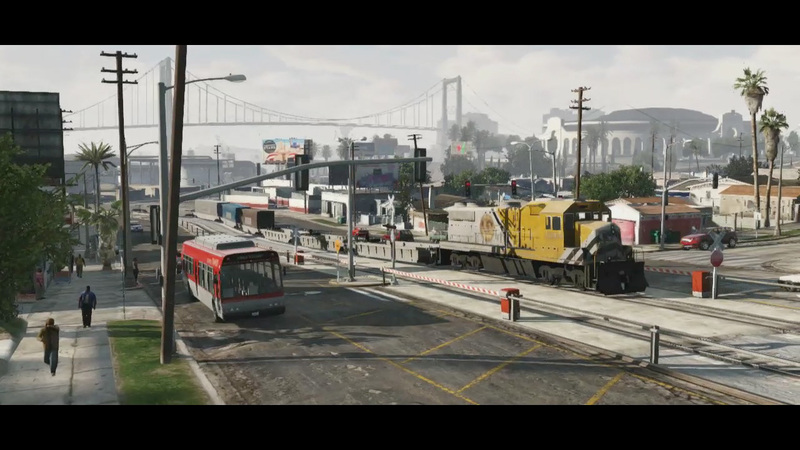 Keep an eye out around the luxurious hangouts of Los Santos great and good such as the racetrack, yacht club and Rockford Hills areas for an increased frequency of Crate Drops containing GTA$10K and exclusive in-game t-shirts featuring knock off versions of Portola Drive's finest luxury retailers, as pictured below. 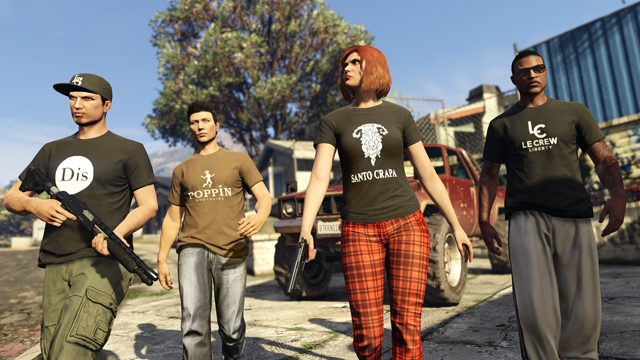 The throwaway fashion industry dictates these t-shirts are only available this weekend in GTA Online, so be sure to keep your greedy eyes on the skies. A fair few of your millions may have been earned through the blood, sweat and grease of completing a Heist, but there's also a tidy GTA$1Million going that you could claim with just a snap of your iFruit's camera. Get camera trigger-happy and enter the matic contest to add some heavy k's to your in-game wallet. As usual Rockstar is looking for the greatest photographs of you living the high life with Ill-Gotten Gains Update content, whether you're parked up rocking one of the liveries on the Winsor Enus, or decked out wearing your cash on your sleeve in the fur and finery of the new wardrobe options. Luxe out your life with the Social Club Event Sweepstakes, live now on the Social Club Events Page. Enter for your chance to win a lavish set of GTAV goods, including the GTA V Chrome Zippo, Grotti Polo, Epsilon Pendant, a copy of the Welcome To Los Santos album, as well as a GTA V t-shirt and stickers. If the thought of all this shopping simply tuckers you out, pull up a pew and kick back with the Official Rockstar Games Event Weekend Live Stream. On June 12th at 5pm ET the Rockstar Broadcast Studio team will be joined by special guests Funhaus to play brand new Jobs from the Ill-Gotten Gains Update: Part One along with custom meta-games featuring the new content. Rockstar will also be showcasing your best Snapmatics from the first few days of the update, and inviting viewers to join the lobbies to play alongside the guests. Sounds good! Crew-up in the forums! 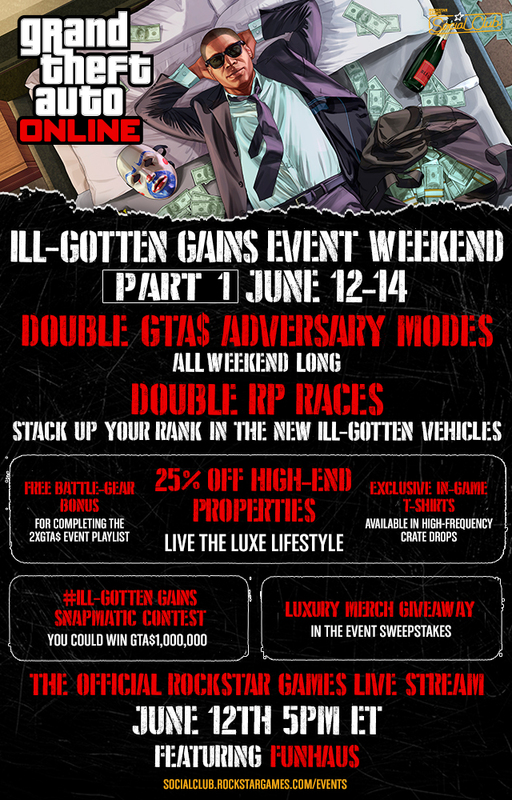 The Ill-Gotten Gains Event Weekend - More RP, more GTA$, more contests, and more other stuff this weekend as a part of the Ill-Gotten Gains Part 1 update for GTA Online.